Advertising and promotion play a vital role in the marketing mix and in both the cases the communication is the key element to inform the customers about the product. The main ambition of the communication process is to attract and influence the buyer’s behaviour. In the path of communication process, the marketing manager analysis the market to find out thatwho their customers are, what are their requirements, how they can be contacted, and what impressive message should be sent to them. Following are the main stages to be crossed while following the communication process to advertise and promote the products. Website statistics especially with the help of social media. Analysis of the buying and sales pattern. Targeting: As the customers are segmented, the nest step is to target the right audience for the advertisement and promotion to ensure best possible response rate. There are various methods inform and advertise the products to the customers. Let’s discuss the main methods. Mass media promotion: In this method, the advertisement and promotion is done via the mass media like newspapers, T.V, Business directories, magazines, radio, outdoor and news agent windows. This is the fastest means of promotion as the media approach is a daily routine in every customer. Sales promotion: In this method of promotion the customer is attracted through the discount gift vouchers, discounts, loyalty incentives and comparison competition. Promotion through public relations: This is the method where the company sends the word to the customers in the world through press conferences, PR events and Press releases. Personal selling:This method promotes one to one communication with the buyers. This can be done through exhibitions, salesmen, experimental marketing, tradeshows and showroom sales with special counters. Direct Marketing: This method includes sending the words of promotion directly to the customers E Mails, Mail order catalogue, telemarketing, personalised letters and packaging designs. Digital Marketing: This media is new and it targets the internet surfers through blogging, company websites, social media, mobile phone promotion, E-commerce and advertisements on YouTube. Like the completion in the market for the products, the completion of advertising is also getting intense. The traditional promotional media channels are getting saturated. Due to the multi- channel facility, people are not willing to see the advertisements on TV and skip them. In the similar way other medium are also diluting. This makes the research team to be particular in selecting the target audience and segmenting them properly to ensure that which medium would be perfect for the maximum promotion. Positioning: This is a process for developing an image of the company and the product. The image is maintained and created with the proper advertisement and promotion through correct medium. It is to be taken in consideration that the messages through all the mediums and different advertisements should target the same goal and easy to understand by the consumers. The EFSP was established in 1980. It is a forum under which a lot of countries in Europe, work together, meet and exchange their innovative ideas. It promotes the higher standards of advertising and promotion industry in Europe. Annual and lobbying are the two areas that are especially maintained by EFSP. The EACA promotes the full service advertising, media advertising as well as agency associations in Europe. Its prime ambition is to promote effective and honest advertising and create awareness regarding the contribution of advertising in the market economy. It helps in enhancing and developing cooperation between the advertising agencies, media and advertisers in Europe. Advertising Association established the committee of Advertising Practises in 1961 to set up the British Code of Advertising Practices. The Advertising Standard authority was established in 1962 to adjudicate complains about the advertisements. The ASA is a self- regulatory organisation of the Advertising Industry in United Kingdom. The ASA cannot enforce or interpret the legislation because it is a non- statutory Organisation but its code of Advertising practice reflects the legislation in many terms. It is not financed by the British Government but it is funded by the levy of Advertising Industry. Direct marketing: The advertising tools like direct mailing, leaflets, circulars, brochures, catalogues, unsolicited mails all fall under the ASA remit. But the price lists and timetables are kept outside the remit. The private correspondence is kept outside the remit but if the leaflet promotes a new product, it will fall in the remit. Printed Media: The magazines published in UK and the paid off advertisements in the newspapers fall under ASA remit. All the Advertorials are under remit apart from the Advertorials that have control of the editors because then then those advertorials are editorials. Internet: If there are the online sale promotions on the British web page, they are under ASA remit. Apart from this all the company’s websites, paid on advertisements on web pages including the pop ups, sponsor links and banner ads fall under ASA remit since March 2011. Broadcast Media: In 2004 the control of the regulation of Broadcast advertising was handed over to ASA. The sponsorships of the programmes are outside the remit but the advertising programmes and shopping channels fall under ASA remit. The complaints regarding the not delivery of the product is tackled by ASA. Sales promotion: The sales promotion rules are made by the Institute of sales promotion which work on the same code of ASA. Data protection: The ASA require full name of the person who is filing the complaint. The details are never revealed without the person’s permission. The cases when the person needs the money back or not received the goods the ASA can request to reveal the identity. Investigations: The investigators talk to the advertisers for their views on the advertisements and a recommendation is drafted for both the advertiser and complainant. This recommendation is then submitted in the independent Advertising Standards Authority Council. The Adjudication is posted on the ASA’s website and is available for the press and general public. In today’s scenario the advertising and promotion of the products are mainly media oriented. The main ambition of advertising and promotion is to retain the old and attract the new customers with pleasing merchandise. Maximum population these days are internet surfers because of which the information and communication technology is leaving the biggest impact on the advertising industry. Therefore the advertising is done through ICT programmes which are broadcast on the internet. Websites: Recently the trend of advertising though the official web page of the company is very effective. This is a cheap mean of advertising of the company is advertising through its own page. The web developers create the web page with the help of web authoring package. Internet Advertising: Different websites give banner advertisements at the top, side or bottom of the web page. Others are in the form of pop -up windows. Bulk E mail advertisements also allow people to understand the latest trends in the market. Online promotions: The advertising industry target the people using internet withinteractive techniques. The internet promotion is different than the television promotion where the website contents and the advertisements are integrated and published. The innovative methods of entertainment, animation, quiz, riddles, e mails, clips of commercials, screensavers and provision of discount coupons and special offer on specific days attracts the people for the purchase of the fast food. Viral Videos: The attractive and humorous videos on YouTube and television capture the mind of the people regarding the taste of the fast food. The sales rate if products have extensively increased with the video publicity as the kids want to watch such videos again and again and demand their parents for that. Mobile applications:Mobile application publicity has helped in increasing the sale of the products. The companies having a brand name in the fast food market develop the mobile application. Consumers have installed these applications in their mobiles and get discount offers and gift points regularly which can be checked and redeemed from the restaurants. This has increased the craze in the consumers to install such applications and buy the products to earn points and avail discounts. Deliver’s the message clearly: The branding with its logo, name, and striplings communicates and delivers the exact message about the product to the consumers. There are certain creative aspects of advertising in the advertising and promotion help industry that helps in the marketing of the product efficiently. Communication brief:The thorough discussion about the positioning the product, targeting the particular audience, the message to be sent in the public and the designing of the message is the process of communication brief with the creative team. Every company whether it is big or small want to flourish their business and premier services and goods to the customers. The small business outsources the designing of the advertisements and promotions to the advertising agencies and wants to create an impact on the public. For this the companies need to have good relationship with the agencies to be mutually beneficial. There are some ways to work efficiently with the advertising agencies. Set clear goals: The Company should have a specific goal and must be aware of that like the company wants to target the new audience, retain the existing or want to have a strict sale. Be sure that the agency knows what exactly is there in the mind of the company and its expectations. Without clearing the goals it is impossible to judge the effectiveness of the advertisements, slogans, banners, designs and the campaign. Cover the budget basis: The money matters need to be clear. The company should plan a specific budget for each part of the campaign and discuss it with the agencies and tell them an overall budget of the project for the marketing of the small business. The budget should be reviews timely for specific printing projects, designing, administrative cost and agency advertising commission. Establish specific timelines: The Company should be specific about the launch of the product and analysing the intermediate work to eradicate any hassle and save time. The Company should be quick in providing all the information required by the agencies and proof read of the work shown by them. The target of our cosmetics company is to advertise using below the line promotion. Apart from the primary techniques used for the promotion of the cosmetics brand we will use some other techniques used in below the lime promotion strategy. The marketing plan is the document which helps to get the strategies applicable in life. Budgeting is also a marketing plan which helps in maintaining and allocating the budget for the promotional strategy. There are various points which should be kept in mind while the formulation of the budget. Comparing low and high-budget campaigns:While planning the budget for the campaign, a research would be done and market analysis will help us out in determining that the product launching needs a low or a higher budget Campaign. New product considerations: Finally when the budget is ready and getting out of the budget, the plan will be reconsidered and some of the budget will be cut down or else the same plan will be finalised. The development of the market plan is the initial step. The final work is to implement it. Once the Budget is finalised, according to the plan of the company, the selection of the advertisement agency or the in-house advertising plan will be finalised and the budget would be discussed with them, with the special instructions that we cannot go out of the budget. The timely analysis of the money spent on the development of the project will be done to make sure that the budget is not exceeding. The market analysis would be done for the satisfaction that we are not overcharged for anything. To develop the promotional plan for ‘Cricket’ certain steps will be followed. Create the look: The first impression of the image of the car is very essential. A thrilling image of the car will be portrayed in the customer’s mind. These will be created with the big banners with the attractive half image of the car with the short text like ‘coming soon’ along with the special features. The clients will look at the car with curiosity and wait for the release of ‘Cricket’. Picture of the look: During the launch, the complete picture of the car with lucrative and exciting look will be published. The image should be attractive to capture the customer’s mind. Sales brochure: The sales brochure of the car will be sent to all the relative showrooms and a front copy with the image of the car and special features will be published in the magazines and newspapers so that the word is spread about the cricket among the people. Additional promotion: The help of the broadcasting media, internet, catalogues, and view cards will be taken for the further promotion of the car. The information of the car should be in easy words and captivating so that it captures the mind of the people and they talk and discuss about its features. Monitoring the promotional plan: Only planning is not sufficient. The monitoring of the plan is required timely so that the promotion is not stopped till the car is established in the market. Integrated market strategy is the combination of the communication tools and media to spread the information related the chocolate bar. By the combination of various tools like the television, radio, internet, newspapers, magazines etc., the marketing of the specific product is planned. Situation analysis: In the chocolate industry there are the three environmental forces that effect the chocolate production and that is the price of the coco, transportation and competition in the market. Target Audience: First of all the target audience will be selected for the planning of the promotional strategy of the chocolate bar. The kids will play the major role as the target audience. Pricing strategy: The Pricing strategy will be selected so that the product penetrates in the market and is not ignored because of the higher cost. Distribution channel: The proper distribution channel to launch the chocolate bars in the market will be selected. For the chocolate bars the wholesalers and retailers will be the distribution channel. After the completion of the campaign, every week the survey should be conducted to analyse its effectiveness. After the consecutive surveys for five weeks the following points out to be checked. Profits: The net profit of the company will be checked after the promotion and will be compared to the profit earned prior the promotion. If the profit is more, this shows that the campaign was effective or else there were flaws in the campaign. Sales: The Sales rate of the product will be high after the promotion. It will be analysed that whether the high sales rare remains constant or have fallen down in a few days. If the rate is high and constant, this shows that the promotion was effective. Customer Response: This shows that how convinced the client remains after the promotion. This can be checked by calculating the number of new clients following the promotion. The customer rate should be more than the prior 5 weeks before the promotion shows the campaign’s effectiveness. Communication: If the more customers are approaching at the company’s customer desk or customer support for the queries of the product, this shows that the campaign was effective and more customers are willing to know about the product. 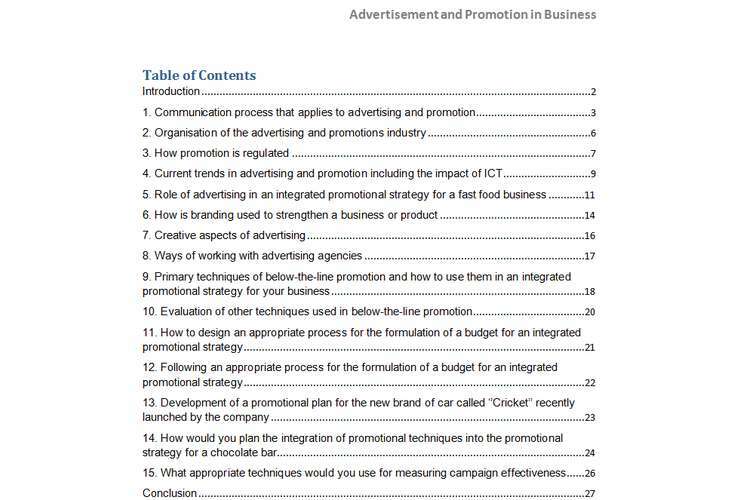 This report helps in understanding the working of the advertising and promotion industry. This enables us to understand about the various methods and the efficient work of all the people related to the advertising company. This shows that the advertisements we watch and get attracted to buy the products shown in them is not an overnight job and requires day and night efforts to design them so they can capture our minds. This report makes us to understand the planning strategies to design these advertisements and the budgeting related to them.